The Bird’s Nest is a community space dedicated to creative play, movement, and connection. Located just outside of the growing Larkinville District of Buffalo, this facility is the first in our region to offer classes in Circus Arts that are accessible for everyone regardless of body type, age, income, or ability. 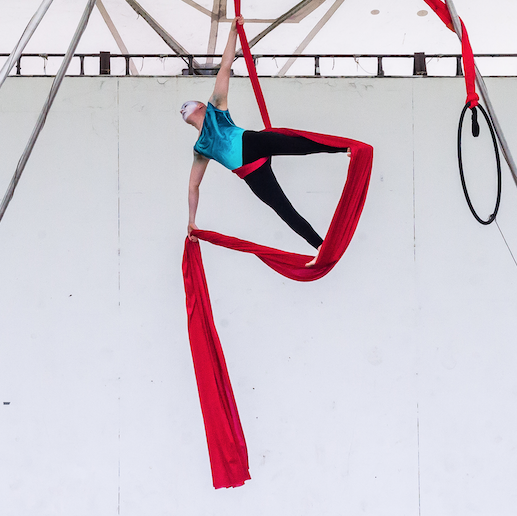 From acrobatics, aerial arts, hooping, strength & flexibility training, to dance, The Bird’s Nest aims to create a safe space that promotes health through non-conventional ways of moving and collaboration. Our flooring is made out of carpet-bonded foam for soft landings. It can be rolled up and moved away for certain classes including dance, hooping, or Cyr Wheel. We have lots of safety mats which are used for tumbling and standing acrobatics, and occasionally for building forts.